The Progress-Focused Approach: When does a country make progress? On this website we usually look at progress at a micro-level. It is also interesting to have a look at the macro-level. For instance, when does a country make progress? The Social Progress Index seems like a useful way to look at that. About what do we think when we ask ourselves whether or not things are going well in a certain country? Maybe our perception of this is heavily influenced by incidents which may recently have happened in that country. Or perhaps we have contradictory information about things are going right or wrong; some things may seem to be going right while others may seem to be going wrong. Or maybe we are influenced in our perception by little more than the level of economic growth of that country. The latter criterion, economic growth is attractive but has distinct limitations. The American economist Simon Kuznets laid the foundation of our current dominant thinking about the success and progress in countries, which is by looking at their gross domestic product (GDP). 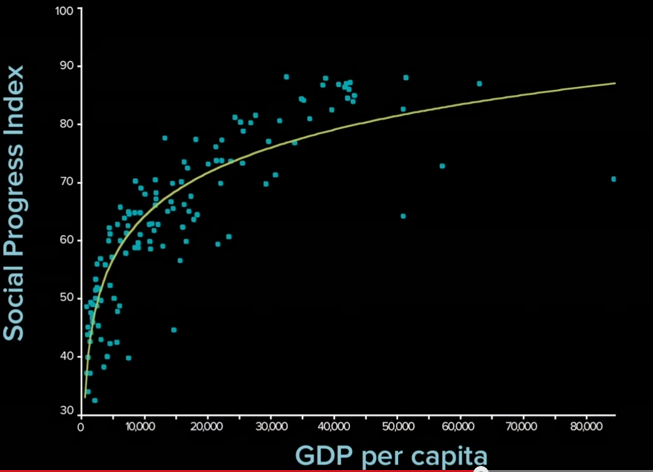 The development of GDP per capita is a measure of the economic growth of a country. Kutznets warned that we should not equate GDP with how well countries are doing overall but we may have not taken this warning seriously enough. Michael Green of The Social Progress Index Imperative explains in this video that GDP has become dominant but gives a flawed view on how well things are going in countries. It says nothing about things like justice, environment, happiness, health, etc. Green proposes a different way of looking at progress in countries: the social progress index. This index looks at 12 items in three broad categories (see table below). 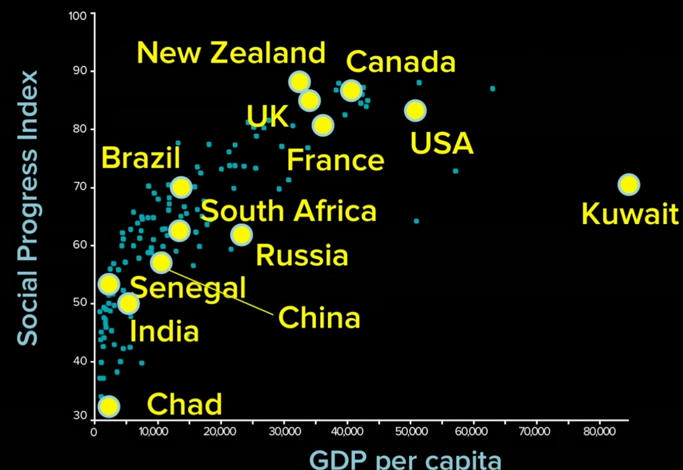 In his presentation, Michael Green shows how GDP relates to the social progress index. The following pictures shows that relation. The first thing to notice is that there is a certain relation between SPI and GDP. This relation is visualized bu the regression line which goes through the point cloud. At first the regression line is steep; further on it flattens out. This means that in poorer countries growth in SPI and GDP to a large extent go hand in hand. When countries get richer, the relation between GDP and SPI becomes weaker and weaker. Some dots are far below the regression line. These are countries with a relatively low SPI considering their GDP. An example of such a country is Kuwait. Other dots are far above the regression line. These are counties with a relatively high SPI considering their GDP. An example of such a country is New Zealand. Find data for your own country here. The relevant question seems to be: as your country becomes richer, how well does it translate GDP into social progress?